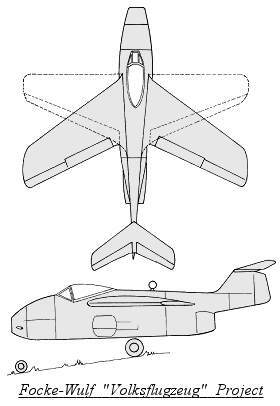 This aircraft project was proposed to fill the Volksjäger (People's Fighter) concept - a lightweight, easily constructed fighter that used very little strategic materials. The requirement for this small fighter was issued on September 7-8, 1944, to Arado, Blohm & Voss, Fieseler, Focke-Wulf, Junkers, Heinkel, Messerschmitt and Siebel. Of the aircraft companies invited to submit a design (please see table below), only Messerschmitt declined. Although the BV P.211 was judged the best, the Heinkel He 162 was chosen to begin series production because they had been previously working on a small fighter design, and had already constructed a wooden mockup. Focke-Wulf's design was made ready by September 18, 1944, only ten days after the specifications had been issued. The Focke-Wulf design's fuselage featured a front air intake, which fed a single BMW 003A-1 jet engine located in the rear lower fuselage. Both swept and unswept wings were proposed for the Fw Volksflugzeug (People's Airplane). The tail was mounted on a boom above where the jet exhaust exited. Mounted on the top of the vertical tail, the tailplanes were swept back in both the straight and swept back wing versions. A single pilot flew the plane from a cockpit located in the forward fuselage, with the canopy offering good vision all around. Armament was to consist of two 30mm MK 108 cannon, all located in the nose and firing forwards. Kurt Tank, the Focke-Wulf technical director, was not enthused about the Volksflugzeug concept. He thought that by the time this project was constructed and reached the front line fighting, it would be outclassed by Allied jets then coming into service plus the fact that the BMW 003 jet engine would be too weak in the long run. Thus, the Focke-Wulf Volksflugzeug design was not pursued.